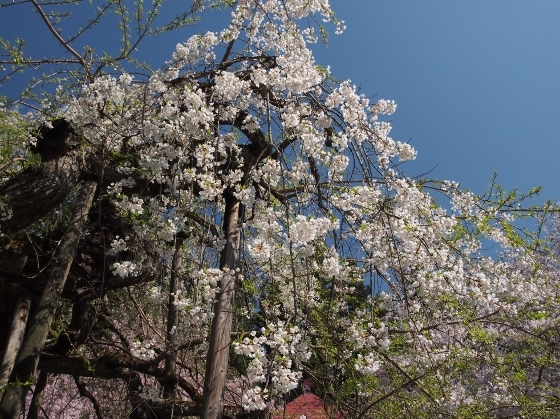 This morning I visited the last one of five traditional cherry trees in Aizu or Aizugozakura. 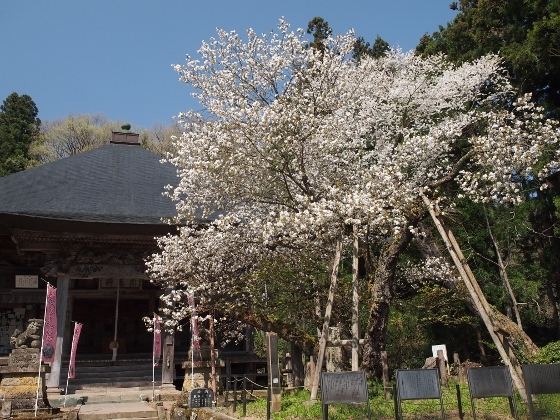 It was called Oshika-zakura located in front of old Iwahashi Shrine established in the year 270 in Inawashiro. 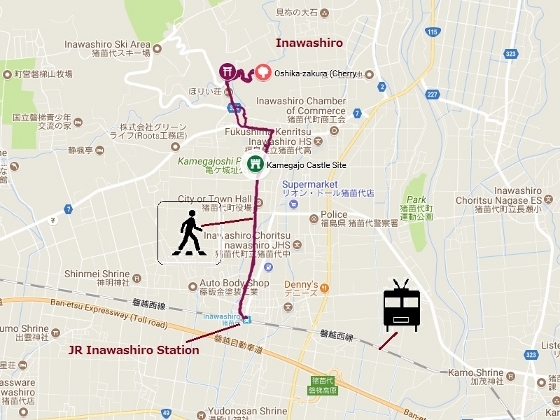 The location was about 1-hour walk from JR Inawashiro Station on the foot of Mt. Bandai and the tree looked as shown above. 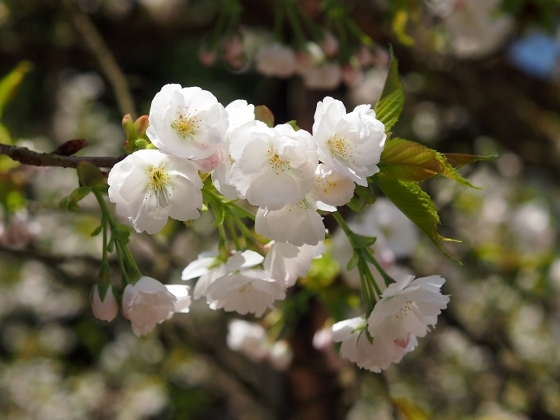 This cherry tree is said to bloom last in cherry blossoms season in Fukushima. A brief description board stood at the site as shown above. 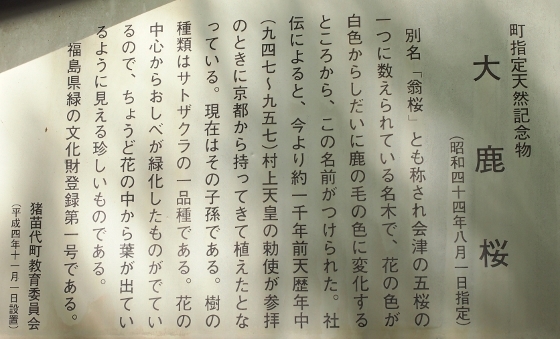 It said that the root of the tree dated back to the year between 947 and 957, which meant more than 1000 years ago. It was first brought from Kyoto. The blossoms were double-petaled as shown in the close-up view shown above. It seems to be a rare variety. 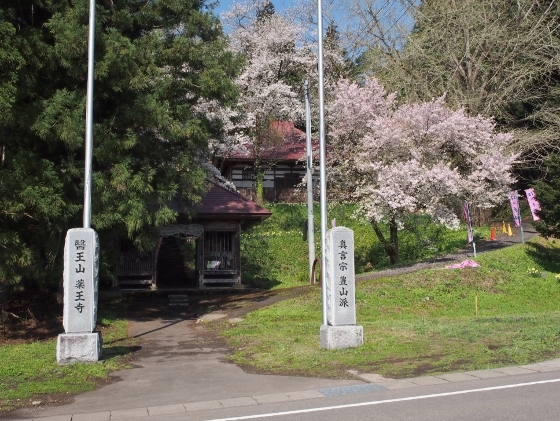 On the way back to Inawashiro Station, I first stopped at Hanitsu Shrine, a historic site where the first lord of Aizu Hoshina Masayuki was enshrined. It was about 10-minute walk from Oshika-zakura. There stood a memorial of the lord with his career and achievements inscribed and a large turtle placed in the bottom as shown above. A board at the site shown above described the history and dimension of the stone memorial. It said the largest of its kind in Japan. 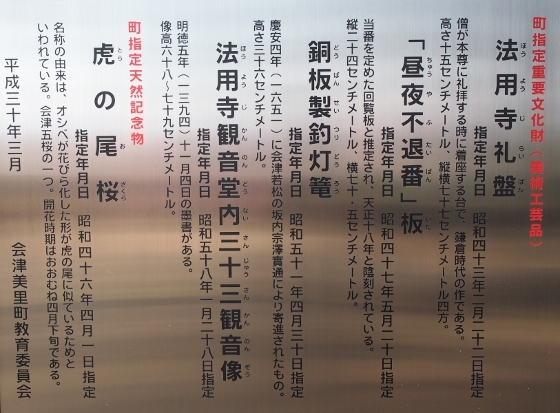 There was a bilingual description board about the shrine as shown above which said the shrine was built in 1675. 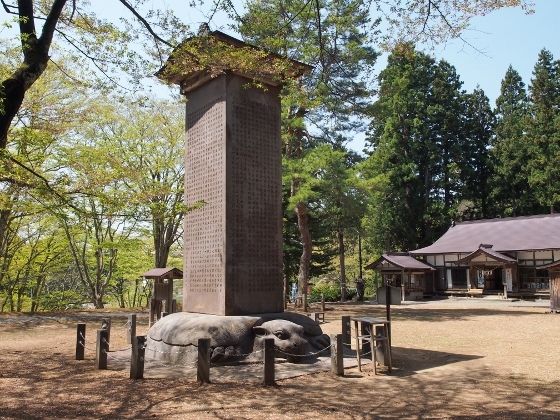 The shrine was designated as a national important cultural asset. Photo above shows the main building of the shrine. 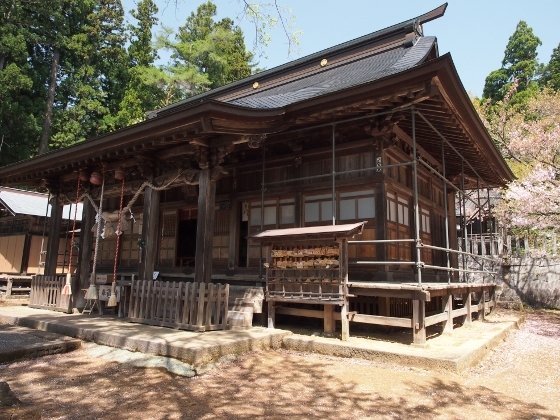 The original one was burnt down at the time of Boshin Civil War and the current one was rebuilt in 1880. My next stop on the way back was at Kamegajo Castle Site. 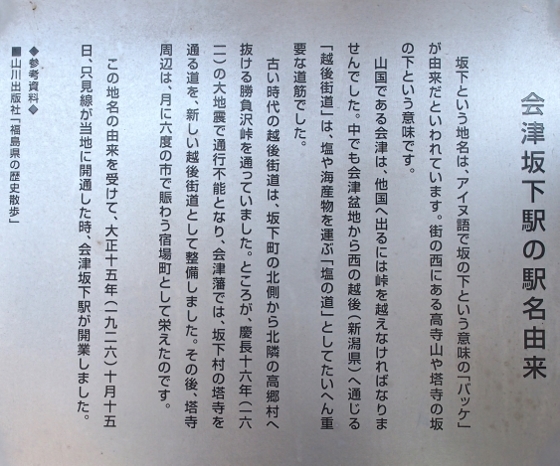 A description panel at the site shown above said the castle was built in 1191 and was destroyed at Boshin Civil War in 1868. No castle building remained today on Honmaru ground which was the center of the site, but it was a nice viewing spot of Mt. Bandai as shown in the picture above. A brief description about the cherry tree was found at the site as shown above. 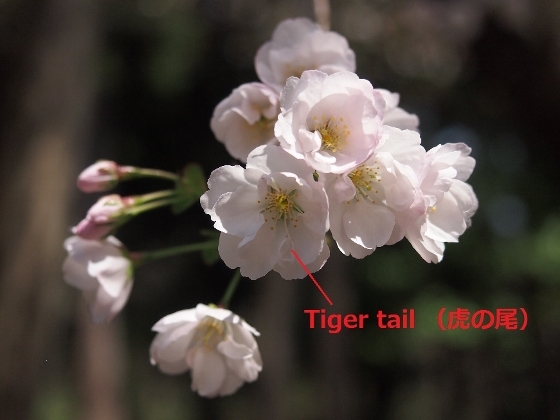 It said that the name “Toranoo” which meant “tiger tail” in Japanese came from its distinctive feature of the flower as explained below. In the close-up view of the flower above, you can find one of the stamens transformed to something looks like a tiger tail. This was a rare variety. 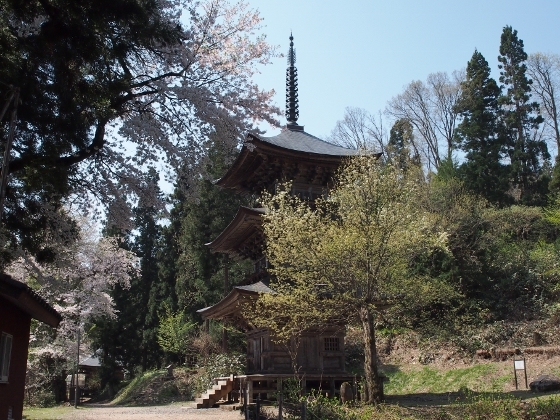 In the same precinct of Hoyoji Temple I could find a 3-story pagoda as shown above. 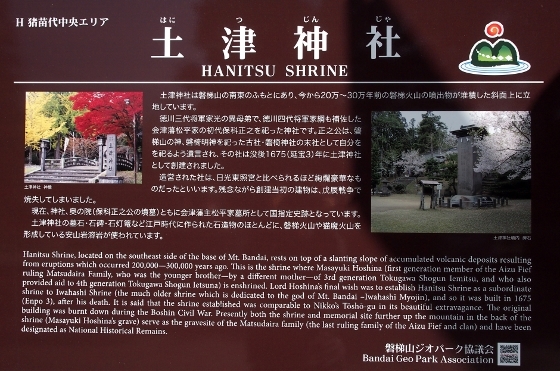 A description on site as shown above said that the pagoda structure dates back to 1780. 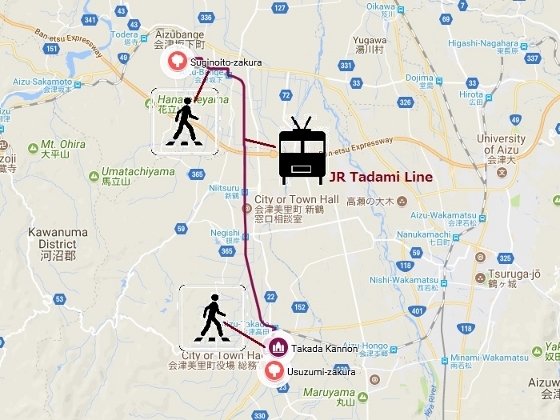 This morning, I took JR trains from Koriyama to get to the nearest station. 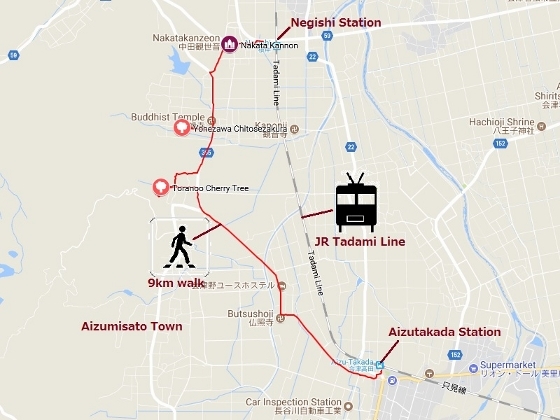 I got off at Negishi Station of JR Tadami Line and started to walk toward Hoyoji Temple. 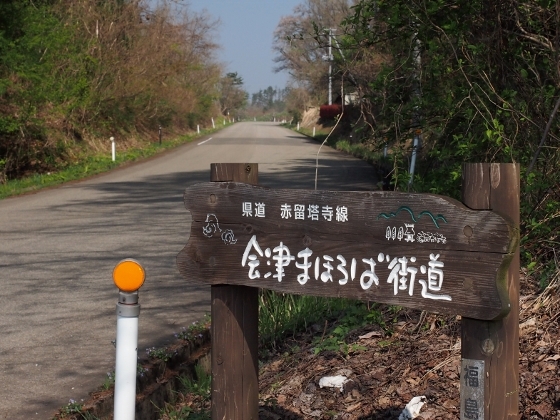 It was a pleasant walk through spring countryside along old highway called Aizu-Mahoroba Highway as shown above. On the way, I first stopped at Nakata Kannon or Koanji Temple as shown above just 10-minute walk from Negishi Station. 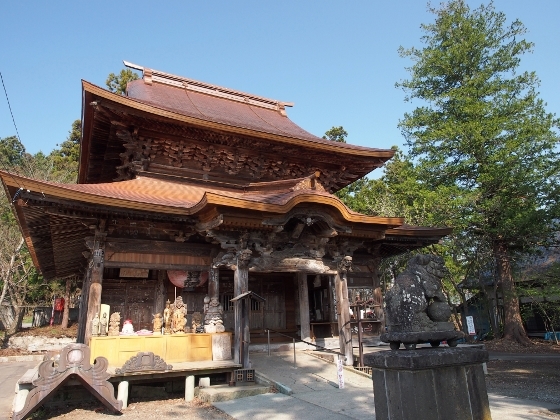 The kannon was also one of Aizu 33 Kannon’s designated as Japan Heritage. 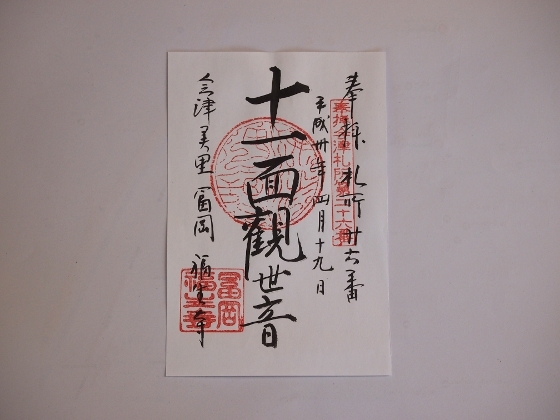 Photo above was goshuin red seal of Nakata Kannon which I received this morning. Then I continued to walk until I found a large and old cherry tree in the middle of paddy field of Yonezawa hamlet. 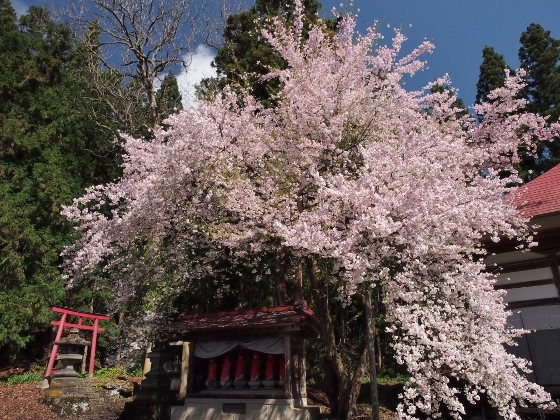 The tree was called Yonezawa Chitose-zakura as shown above. 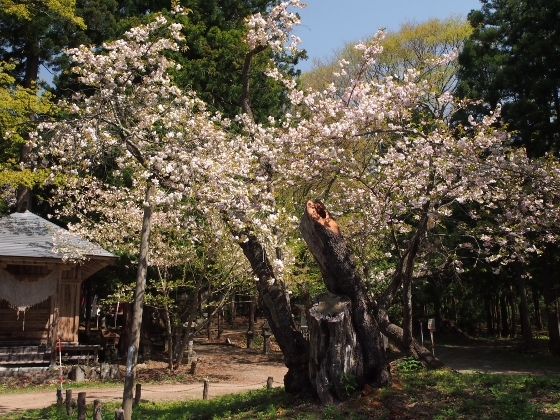 A description on site shown above said that the tree was 700 years old and the blossoms had been a sign of starting rice farming of the season from old days. Actually, local farmers were fertilizing the field today in preparation for starting rice planting. After I left today’s last stop at Hoyoji Temple I walked to Aizutakada Station and took JR Tadami Line train back to my home. The total walking distance was 9km. 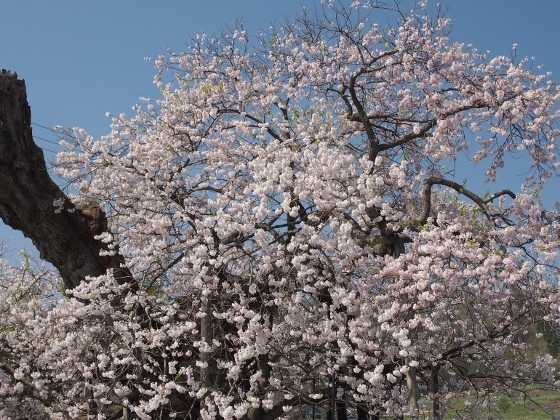 Lastly, I want to introduce the 4th of Aizugozakura, five traditional cherry trees in Aizu. This is called Ishibe-zakura in Aizuwakamatsu as shown in my blog of 2016. The tree blooms earliest among the five Aizugozakura’s. Meanwhile, the last blossoms among the Aizugozakura’s will be from Oshika-zakura in Inawashiro and the forecast of this season’s blossoms is at the end of this month. I will show you then. 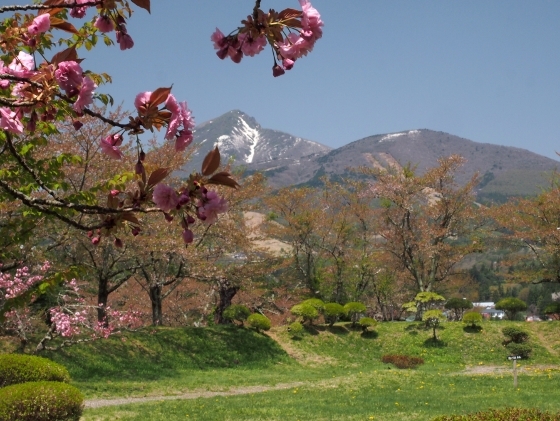 There are five designated traditional cherry trees in Aizu. These are called “Aizugozakura”. These are famous not only for their old age, but also for each distinctive variety and nature. Today I first visited Suginoito Cherry Tree in Aizubange which was located in northwest of Aizuwakamatsu. 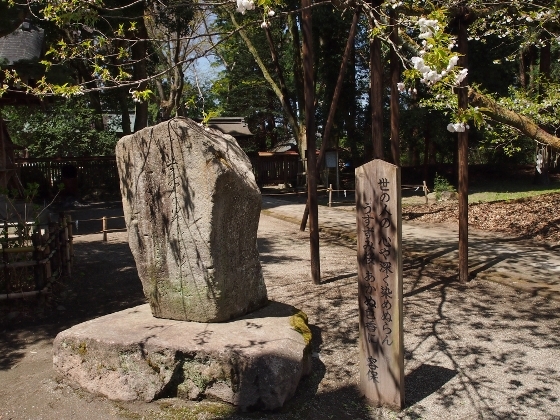 The tree stood in the precinct of Yakuoji Temple which was about 30-minute walk from JR Aizubange Station. The view was beautiful with the southern part of the tree in full bloom as shown above. Small white blossoms were shining blight with the background of blue sky. Photo above shows the entrance of the temple. It faces a local road. 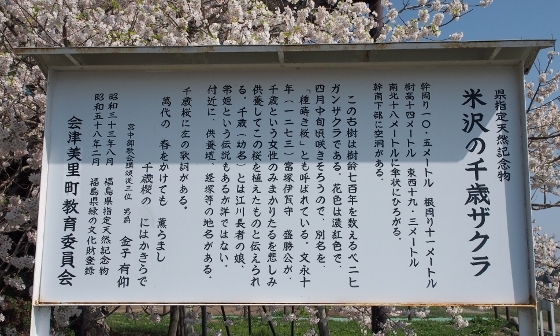 A brief description board stood at the site which said the cherry tree was planted more than 400 years ago. It had been famous for its elegant weeping style. 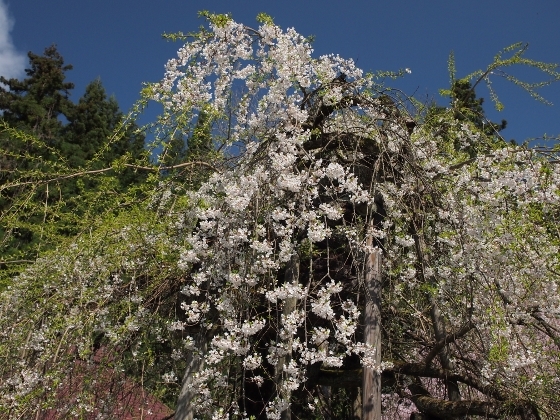 Photo above shows another view of Suginoito Cherry Tree from a different angle. 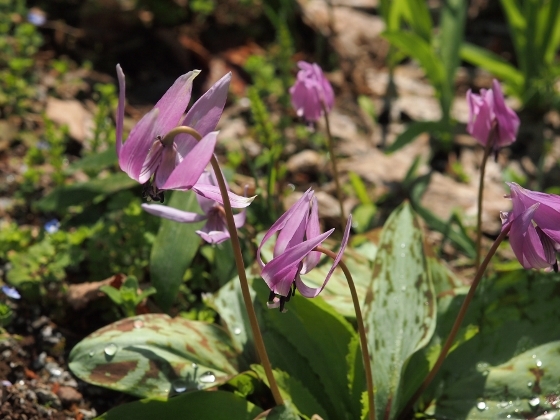 On the ground surrounding the Suginoito Cherry tree, beautiful violet flowers of dogtooth violet were found here and there as shown above. 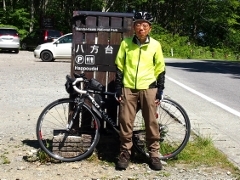 Then I returned to Aizubange Station and moved to Aizutakada Station on JR Tadami Line. While waiting at the station I found a board explaining the origin of the name “Aizubange”. It said that the origin was “Bakke” from Ainu which was a language spoken by indigenous people of Japan. The word meant “down the hill”, and this meant Aizubange plain was surrounded by hills. Getting off from the train at Aizutakada Station I started to walk toward Isasumi Shrine in the center of Aizumisato Town. 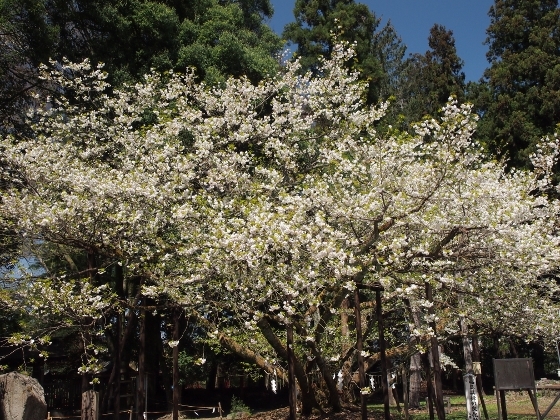 There was another designated traditional tree of Aizu called Usuzumi Cherry Tree as shown above. This was a sacred tree of the shrine or “Goshinboku”. The original tree was very old and the variety was very rare. When I visited two days ago it was only 30% bloom but today almost 100%. 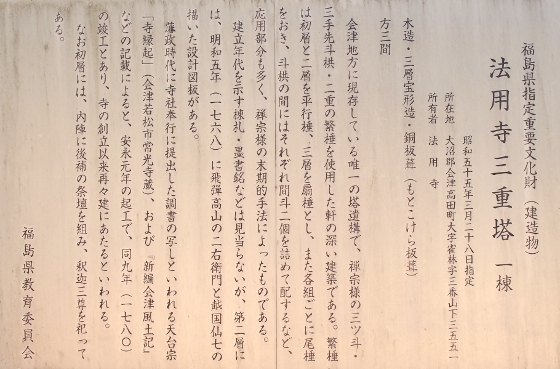 I found a stone monument inscribed with waka poem composed by the last lord of Aizu Matsudaira Katamori as shown above. 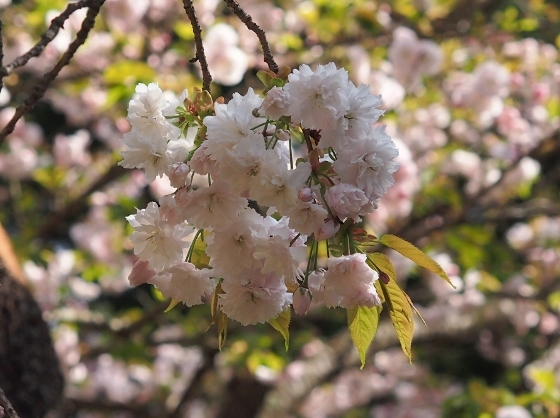 He praised the color and fragrance of the cherry blossoms in his poem. A close-up view of the blossoms, cute and pretty, is shown above. Leaving the shrine I stopped at a viewpoint called Miyakawa Senbonzakura just adjacent to the shrine. 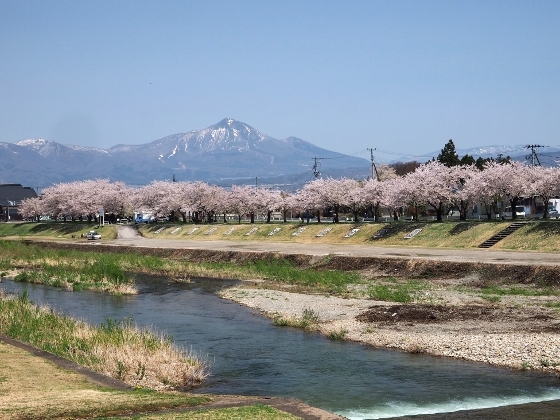 I could see a view of cherry trees along the Miyakawa River with the background of Mt. Aizubandaisan as shown above. On the way back to Aizutakada Station, I stopped at two of the temples in the town. 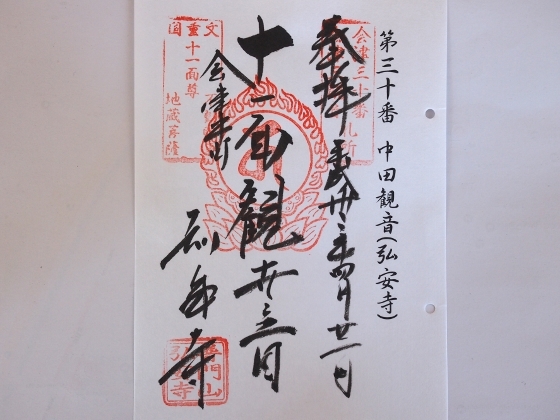 The purpose was to receive goshuin red seals of Aizu 33 Kannon series. 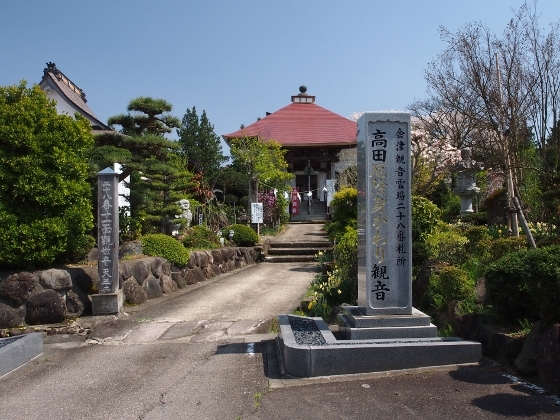 The first stop was at Ryukoji Temple to receive goshuin for Tomioka Kannon in the town as shown above. This was the 26th of Aizu 33 Kannon. 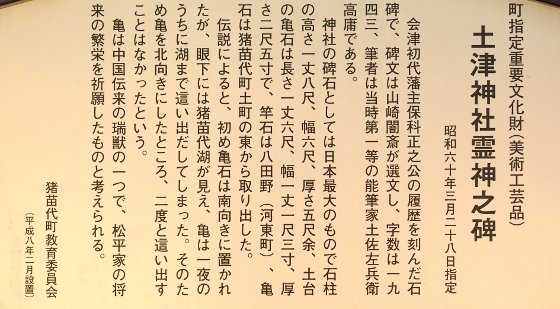 Tomioka Kannon belongs to Fukushoji Temple in the town not to Ryukoji Temple, but as for issuing goshuin seal Ryukoji Temple takes the part, somewhat irregular practice. I visited Tomioka Kannon in 2016 as shown in this blog. The second stop was at Takada Kannon and Tennoji Temple as shown above. Takada Kannon was 28th of Aizu 33 Kannon series. 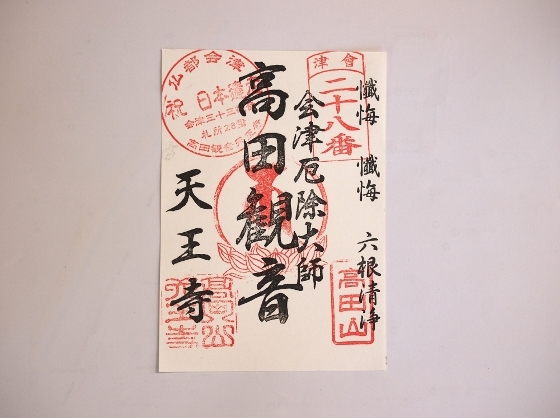 The goshuin red seal of Takada Kannon I received today was shown above.